Gifted with the power of super speed, the Flash is one of the most popular characters of DC Comics and a main member of the Justice League. Multiple heroes exist under this alias, including Barry Allen, his nephew Wally West, grandson Bart Allen, and parallel world speedster Jay Garrick. When taken to its extreme, the abilities of the Flash enable him to travel through time and space, making him an incredibly powerful superhero. The Flash has recently appeared in a CW live-action series of the same name, following the adventures of Barry Allen. 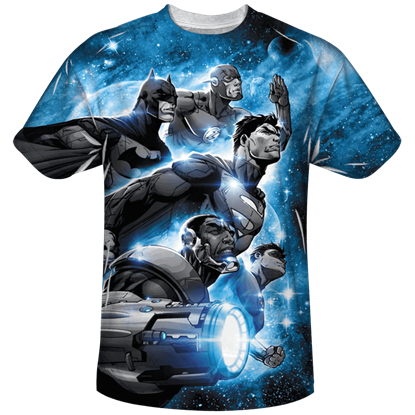 At Superheroes Direct, we feature a multitude of Flash-related merchandise and collectibles, including t-shirts, costumes for children and adults, statues, socks, playing cards, POP figures, paperweights, hoodies, keychains, and more all based on the looks and symbols of various iterations of the Flash, from comic book to TV and movie appearances, as well as figures of his recurring adversaries like Captain Cold and the Reverse Flash. 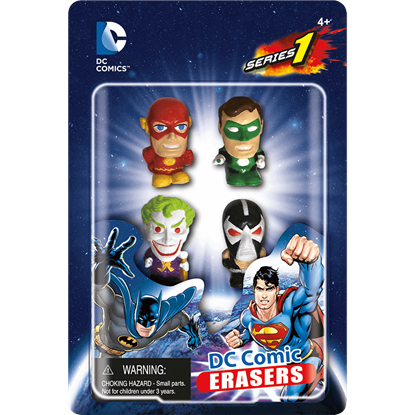 Two superheroes go up against two diabolical villains in this 4 Piece DC Heroes and Villains Eraser Set! Add this set to your collection of writing accessories for an exciting and unique way to show off your love of comic books. Barry Allen becomes The Flash after a work accident involving lightning and a particle accelerator. As a result of the accident, he is able to move at superhuman speeds. 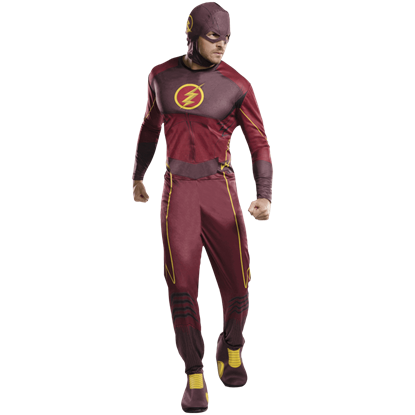 This Adult Flash Costume is based on the CW television series. Before he became The Flash, police scientist Barry Allen had a reputation for being slow and frequently late. Based on his classic look, this Adult Superman Muscle Chest Shirt Costume is perfect for Halloween or any costumed event. 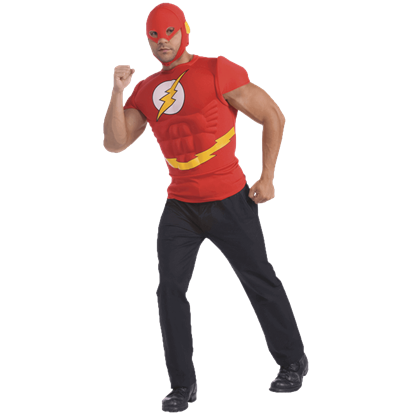 Neither speed nor comfort is lost when choosing to wear the Adult The Flash T-Shirt With Mask for Halloween. The Scarlet Speedster will discover that his travels across the DC multiverse are much more relaxing with this stylish tee. 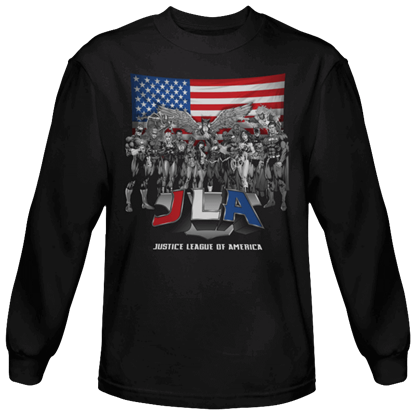 The perfect shirt for all patriots who also have a passion for comics, the All American League Long Sleeved T-Shirt features an image of many well-known Justice League of America members standing in front of an American flag. Able to move at the speed of light, the Flash is one of the quickest superheroes in the DC Comics universe! 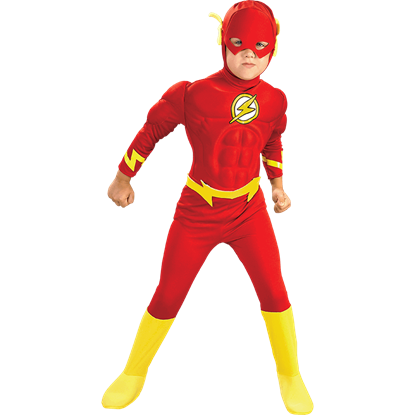 Your child can become the latest incarnation of the Scarlet Speedster with the help of the Boys Deluxe Flash Muscle Costume. Possessing superhuman speed and reflexes to match, the Flash is a spectacular superhero who got his start in 1940. The Classic Flash Logo Kids T-Shirt is designed to emulate the look of the suit worn by the Barry Allen incarnation. 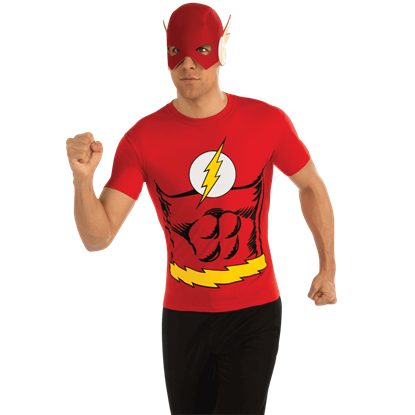 Typifying the look of the Crimson Comet, the Classic Flash Logo T-Shirt prominently displays his signature lightning bolt symbol on the chest. This shirt is an exceptional way to show your support for the Flash. 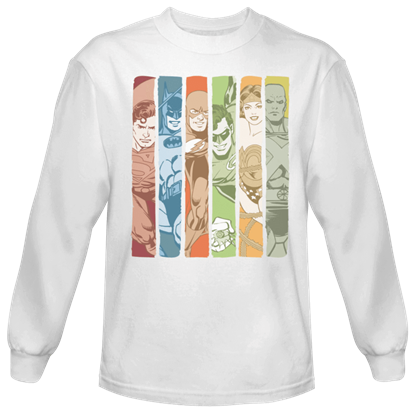 Splendidly depicting several founding members of the original Justice League in an eye-catching design, the Classic JLA Columns Long Sleeved T-Shirt is a magnificent way to display your support for this legendary team. You can show off your love of the Crimson Comet just about anywhere with this DC Comics Flash Figure! Depicting one of the most well-loved superheroes, this action figure makes a fantastic toy or display item for fans of all ages. A golden lightning bolt blazes across a red-clad chest. It marks a hero known for inhuman speed and reflex. 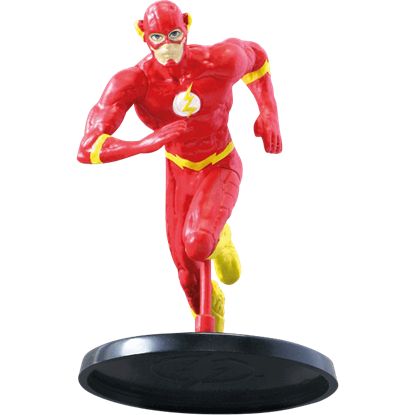 Let the legendary icon of your favorite superhuman hold fast to your vehicle with the DC Comics the Flash Logo Magnet.